Once again, Jim Vilk has joined me to take us through a look at what is not necessarily an obscure sport (it is, after all, college football), but a division of NC2A football that doesn’t necessarily get a lot of play, at least on TV or the UW boards. Division II football may not get the headlines like Penn State, USC, Florida or Notre Dame, but they still play football at these schools. It’s really great, they’ve got uniforms and everything. Join us, at least for this article, in a world where things are not as they seem – where Cleveland is in Mississippi, where Pittsburg has no “h” and is in Kansas, where California and Indiana are in Pennsylvania, where the season starts in August and ends in December. This is the world of Division II football. Why Division II? Well, for one thing, we’ve all seen, heard or discussed the uniforms of the major schools by now, or we will very soon. Today, we’d like to show you how the schools on the proverbial “other side of the tracks” dress their players. Also, we’d like to showcase a little slice of college football that still has that old college feel to it – smaller, intimate venues, players that mostly play for the love of the game (although a number of D-II players have gone on to have prosperous careers in professional football), a name that still rolls off the tongue, as opposed to “Football Bowl Subdivision” and “Football Championship Subdivision.” Jim’s still calling them “Division I-A” and “Division I-AA.” Jim still likes that it’s called “Division II,” although it wouldn’t surprise him if the eggheads in the NC2A eventually call it the “Football Championship Subdivision Second Stratum,” or something equally goofy. 1. Grand Valley State: This school in Allendale, Michigan boasts a team that is riding a 43-game regular-season unbeaten streak. The Lakers lost in the quarterfinals to eventual champion Minnesota-Duluth last season, but they won it all in 2002, 2003, 2005 and 2006. They’ve gone for the bruiser look with basic black and blue uniforms. JV: I like the color combo enough that the plain black pants on the home and away unis don’t bother me. I also don’t mind the jersey side stripe that goes from the armpits to the waist. The helmet logo being obscured by the ends of the chinstraps, though, is a problem for me. That’s a common occurrence these days, but they seem to be the worst offenders on this list. Overall, I like the look. PH: I will concede I know nothing of the official colors of any of these schools, so I can’t rail against this uniform from the standpoint of it being BFBS. And I will agree with Jim that black and royal can be a decent combination. This uniform though, is typical of what I personally dislike about many of today’s unis: unnecessary jersey piping and striping. And an all-black combo? Um, no. Ditch the monochrome look or at least add some striping on the pants, please. 2. Northwest Missouri State: Although the Bearcats have won titles in 1998 and 1999, they have been runners-up in the last four championship games. While they might be trying to get leaner and meaner this year, they can’t get much greener. They opened on the road with green helmets, plain green pants and white jerseys. Last year they had all-green and all-white unis with contrasting side stripes and green helmets. The side stripes were too much – on the whites they started at mid-shoulder, went under the armpits and faded out above the knees. On the greens, there was one stripe that started at the base of a shoulder, went below the armpit, snaked underneath the rear jersey number and went up to the base of the other shoulder. JV: If I had to choose between the two I’d take the green unis, probably because I liked the number font so much on those. Keep trying, Bearcats. You may finally bring another title to Maryville this year, but your uniforms fall a little short of championship caliber. PH: Oh no…just, no. Were these guys one of the “models” for the Jaguars new look? God I hate that “stripe” that runs around the back of the jersey. And what’s with the truncated pants stripe on last year’s white pants? Ugh. Too bad too that they ascribe to the monochrome look — I really like the green and white as colors, but for the love of God, don’t wear the all green. In fact, don’t wear green pants at all, but if you do, you need stripage somewhere. 3. University of Minnesota-Duluth: The defending national champions look pretty old-school classic in their maroon and white home uniforms. JV: I’d design a different helmet logo, but it’s not that bad. The road unis, on the other hand … where did the black extended armpit come from, anyway? The Bulldogs seem a little schizophrenic with their classic and trendy looks, but overall they’re winners. PH: Now you’re thinkin’ with your dipstick, Jimmy. THIS is a uniform (excluding that roadie with the pit stripes and jersey panels) I really like (the maroon over white). Unfortunately, it’s the lone exception in a sea of “new and hip/trendy templates” we’ve seen and will see more of below. Nice to see Nike making a classic uniform — you may say it’s boring, but I say it’s just right. I’ll agree with Jim that maybe the helmet logo could use a tweak or two, but I’m not gonna complain. Replicate that look for the white jersey and this one is pure win. 4. 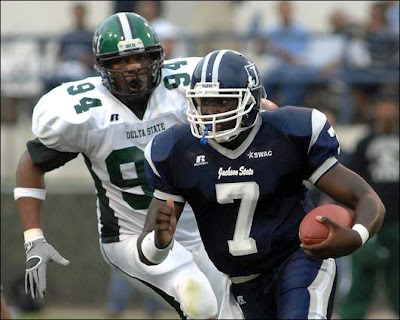 Delta State: There’s no championship curse in Cleveland. Well, not in Cleveland, Mississippi, anyway. 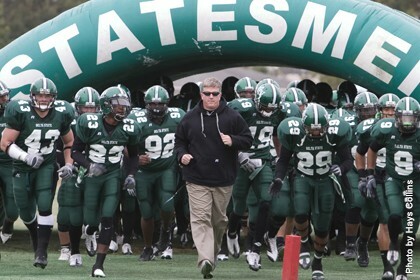 The Statesmen won the 2000 national title and they’re hoping to contend for another one this year. Uni-wise, there’s not a lot to talk about here – they’re pretty basic with green helmets, an all-green look at home and an all-white uni with green side stripes on the road. JV: Classy and understated like the official mascot. The unofficial mascot, the Fighting Okra, is another story. 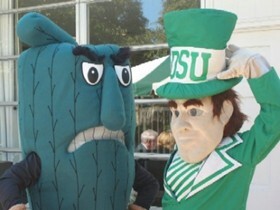 That’s one mean veggie standing next to Mr. Statesman. PH: Well, I have basically the same problems with Delta State as I did with NW Mo. State. Monochrome, particularly in dark colors, just is NOT a good look. The white roadie is much better, although, there we go with the side panels again. Lose those and that all white look is nice! Since Russell makes (or made) these unis, I can’t even go blaming the swoosh or three stripes for the side panel madness — it seems everyone is in on it. And while I will concede that if the side panel is the only “new school” element on the uniform, it’s certainly something I can live with, if not accept. Great helmet for Delta too. But what’s up with the Fighting Okra? Do they really need two mascots? 5. Abilene Christian: The Wildcats from Abilene, Texas are the first of two consecutive purple teams, so those with an aversion to said color can skip ahead to number 7. ACU ran into a little trouble with the NCAA and had to vacate their wins from the 2007 season. This makes the school’s first official playoff victory last season’s 93-68 drubbing of West Texas A&M. The following week the Wildcats were eliminated by eventual runner-up Northwest Missouri State. JV: I like their look, but there’s one oddity I’ve never seen. The little stripe that runs from the collar to the pits is fine, but then it expands into a diamond shape on the side of the jersey. You can see it on the purple and white unis. Normally, I don’t like pants stripes that don’t go all the way up the legs, but these stripes that start at the knee and fade out at the upper thigh don’t look too bad. The sleeves have the same interlocking ACU logo from the helmet. You can see these on this shot of the all-white unis. As far as newer designs go, this is one I can handle. Good job. PH: And yet, as far as newer designs go, this is the sort of stuff I detest. But hey, I guess I shouldn’t get my pants in a bundle, they are Div II — and the unis scream that loud and clear. I have no problems with the color purple (so long as they don’t ever do this). Unfortunately, the very problem I have with the Vikings’ uniforms is the same problem I have with these — the superfluous piping and non-linear striping. I guess this is the hip new direction of uniform design. May it soon go the way of the dodo. 6. North Alabama: Quick, name a Divison II football coach … We’re waiting … Actually, it’s not as hard as you think. Terry Bowden has left the TV studio and returned to the coaching ranks for the first time since 1998. The former Auburn Tiger coach is now leading a different group of cats. The Lions, from Florence, Alabama, are hoping Bowden takes them all the way to … Florence, Alabama. The D-II championship has been played at UNA’s Braly Municipal Stadium since 1986, and the Lions won titles there in 1993, 1994 and 1995. They are the only team to win three straight D-II championships. Last year they made it to the semifinals, losing to Northwest Missouri State. JV: North Alabama looks a lot like Abilene Christian, but slightly better in my opinion. They have the same funky diamond thing on the side, shown in this shot of the purple jerseys, but the TV numbers are on the sleeves. I like the old-school look of sleeve numbers, so home or away, I really like this uniform. PH: I know we’re seeing a pattern amongst these schools, so I’ll try not to hate on every single design that features the piping and striping, but this may be the worst of the bunch. Monochrome purple, for at least one combination, pushes them to the bottom. Even old school numbers (why bother) can’t save this mess. The white get up is actually good looking in comparison — and that’s not saying much. They suffer, as do many Div II schools, from what Ricko and I term “one too many bumpersticker syndrome.” Fail. 7. Pittsburg State: No, Toto, we’re not in Pennsylvania; we’re in Kansas. No “h” at the end of this burg. Holy Dan Marino! Is that a script Pitt we see?! It is! At least someone respects a cool helmet logo, even if it’s not the exact same script. The Gorillas (they’re the only school to use this nickname) have one D-II title, coming in the 1991 season. JV: I like the ketchup and mustard look, even though Pitt State tweaked this year’s home unis to look like the previous two schools. Last year’s home and away unis were a classically cool sight to behold. Red helmets, yellow pants, red or white jerseys, TV numbers on the sleeves – it all worked for me. I’d rather they kept that look, but this year’s aren’t terrible. Just keep that script, Pitt State. PH: Falling into the “just one more bumper sticker” syndrome, yet another team has succumbed to this rampant design crutch. Not that the condiment unis were any great shakes last year, this year, they’re … worse. I wouldn’t say they were “classically cool” as Jim did, but they were at least, somewhat quasi-football looking. Now, just another computer generated template brought to life in 3-D with the colors changed. When ONE team has this sort of look, it’s unique and refreshing. When they ALL have it, particularly when it’s not a particularly good design element — it makes them all look bad. Can I say anything nice about the unis? Yes, I like the helmet. 8. California University of Pennsylvania: No, dude, we’re not on the left coast. We’re about an hour south of Pittsburgh, PA. Jim doesn’t know if anyone’s done a study, but he’s willing to venture Pennsylvania has more cities and towns named after other states than anyone else. Oklahoma, Wyoming and Indiana (which has a D-II school playing in the same conference as California) come to mind off the top of his head. Jim saw California play last season against Slippery Rock. He had been wanting to see the school that accepted him (“but I turned down to stay closer to home and my job”) play against the school Dave Diles used to mention all the time on the old ABC college football scoreboard show. Jim had a good time, too, which kind of fueled his interest in Division II football. The Vulcans have made it to the semifinals the last two seasons, losing to the eventual champions each time. This year they opened the season with a rare loss – perhaps becasue they came out wearing these new unis? JV: I can live with the all-black look with red trim, but the wide collar-to-sleeve red stripes just don’t look as good as last year’s more conventional red-white-and-black shoulder stripes. I like shoulder stripes almost as much as I like sleeve numbers, so imagine my chagrin. Oh well, life goes on, but here’s a final look back at last year, with the old away jersey. I won’t miss the number font on that one. If they would have gone with block numbers, or the kind that Northwest Missouri used, it would have been one of my favorites. 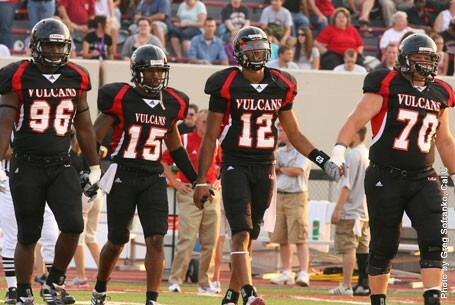 PH: It’s hard not to like a team named the Vulcans. But this was before I saw these unis. Again, I don’t know if they’re just BFBS, but its another disaster. Dropping the decent looking shoulder loops (at least I think they’ve done that) in favor of the random red and white side panels turned a somewhat nice looking uniform (and a nice jersey, so long as it was paired with something other than black pants) into typical “forward looking design” crap. The old unis had drop shadow numbers while the new numbers have a red outline. At least they got that going for them. 9. Carson-Newman: The Eagles came oh, so close to having Jim’s favorite unis on this list. Unlike many of you, he’s sure, he only has two problems with this orange and blue feast of mix and match possibilities. JV: I don’t like the curved pants stripe that starts at the waist and tails off at mid-thigh, and I don’t like the number font. This picture better shows the numbers, which look as if they have thorns sticking out of them. Some of you may say, “Golly, Jim, that sure is a busy looking uniform.” I say, fix the numbers and the pants stripe and this is a classicly loud thing of beauty. Maybe it wouldn’t work with other colors, but it works with these colors for me. I also like that the folks in Jefferson City, Tennessee get to see a different eagle logo on their school’s helmets, unlike so many other Eagles teams. PH: I guess they have a pretty good uniform budget, seeing as they have more uniform combos than any college team not from Oregon. Jeebus. I actually don’t mind teams who can wear a couple different jersey and pants combos, but this isn’t one of them. Colors are fine, helmet is nice. But those godawful wide stripes, in various shapes and sizes, are too much. This one has so much possiblity, but in an effort to incorporate a different pattern, style or color into every inch of every jersey, it just doesn’t work. Really, if they could tone down the color shifts and splotches, these unis have great possibilities. Unfortunately, “one more bumper sticker” is in full force. 10. Chadron State: These Eagles, from Chadron, Nebraska, got a new eagle helmet logo this season. Previously, they looked like a cardinal-red version of, you guessed it, the Lock Haven Bald Eagles. JV: Yeah, I know, they also looked like a certain NFL team with the fans who booed Santa Claus. Former Buffalo Bills receiver Don Beebe went to school here, so that is Chadron’s claim to fame. Their unis, on the other hand, are a little too plain and forgettable for me. Change the number font. PH: Oy. More monochrome darks, more truncated pants striping, more panels. I guess that’s par for the course for Div. II. Actually, I kinda liked their old helmet design — the one that looks like the current Eagles (of Philadelphia NFL lineage) helmet. Even the new helmet, while maybe original, is a downgrade. The all white road uniform that Jim showed wasn’t too bad, but where they add too much to the uni by adding panels and junk, they take away too much by wearing plain white socks. Hello? There’s your chance for a bold color statement, instead of making even your roadie look like a ballet outfit. Thus ends our quick tour of the world of Division II football. If you survived it in one piece, perhaps we can look at the uniforms of Division III someday. As you can see, time marches on, and the old-time feel of small-college football doesn’t always have the old-time look. Hopefully you found something you liked, though. Jim did. PH: I wasn’t quite as pleased. I’m not opposed to new because it’s new, but this set of unis seem to be more of the same set of “bumpersticker” syndrome. More is not necessarily better, and new isn’t always good. I realize most of these uniforms are probably templates and Div. II schools no doubt don’t have the money (nor do the uni makers have the desire) to create unique looks for each team. But the prevailing trend to wear all dark at home (I don’t mind the all white on the road) is annoying, not to mention, usually an eyesore. And the unnecessary panels, stripes (thin and thick) in every which direction and seemingly without purpose or thought just rub me the wrong way. But hey, that’s just my opinion — I could be wrong. Yesterday featured the first batch of “new Crew” uniforms. However, two readers also sent me redesigns for teams besides the Brewers. Also yesterday, I asked you graphic designers out there to send me your submissions for more teams (baseball only, for now, please), you’d like to see in a new design. If you’re interested, or you’ve already got one, gimme a shout. 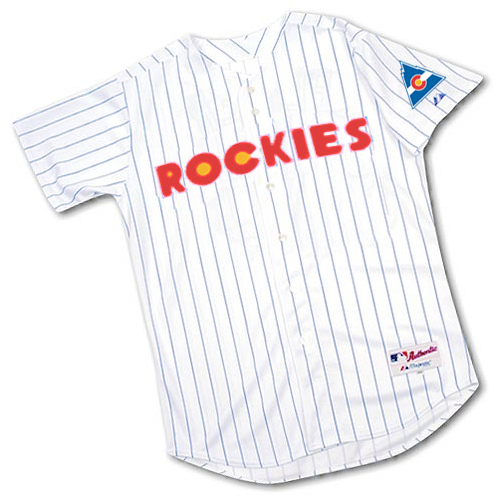 I based these Colorado Rockies jersey mockups off of the old school logo of the hockey Colorado Rockies before they became the New Jersey Devils. I made them a pull-over top such as the Blue Jays and the Cards from the 70’s. I created two different home looks, as well as an alternate that pays homage to the Colorado Flag. The black jerseys are also a big hit out here, so I created a look for one of those. Indeed, when it comes to the Mets, less black is usually much better. He has come up with three new uniform concepts: a clean new home and away set, with all the black removed (but where are the stirrups??? ); and two alternates. The first, featuring pinstripes (I guess we can say they’ve reduced the once venerable pins to an alt) and a royal blue top with “New York” in fancy block letters. 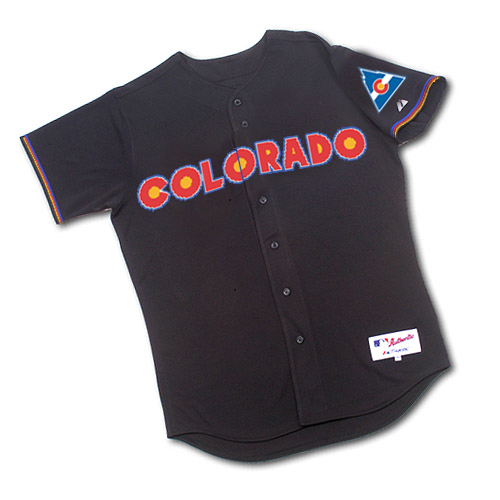 As you know, I’m not a fan of the “alternate/softball” tops, but if the Mets could replace the black tops with this one, I’d be 100% behind it. Finally, Alex came up with another home alternate, and it is considerably more colorful. He combines a new alternate cap, featuring a blue crown and an orange bill, with a new orange alternate top (plus he has put the script “Mets” on the blue alternate). Beauty is in the eye of the beholder, and I’d have to see the orange top in action, but I can’t help but think of this disaster when I see an orange top. But, an A+ for effort Alex. Guess The Game From The Scoreboard: Today’s scoreboard comes from reader Louis Griffel, who’s sent my way and oldie and (I hope) a goodie. All the clues are right in front you but it may still prove a challenge. As always, date, location and final score are required. Just post the answer with a link to Retrosheet or Baseball Almanac, and tell us how you went about discerning the answer. OK? Ok. Guess the Game from the Scoreboard. And if you’d like to submit a scoreboard to challenge the readers, you know what to do. Good Luck! Got a brand spankin’ new weekend strip for you today, courtesy of the Rick. Like I said yesterday, keep your eyes peeled (never understood that expression) for an announcement of a real, honest-to-god Benchies blog, where you’ll be able to get your Benchies fix 24-7, plus I am sure a bunch of other goodies from Mr. Pearson. Until then, enjoy your Sunday Benchies. That all for today, folks. Send me your uni mocks, stay tuned next weekend for Part II of the Brew Crew Review, have fun at your Laborious Day BBQs, backyard bashes, baseball, bags and beaches, and get ready for some football. Have a great Sunday! Twins at White Sox. Must be 1961 or later. No DH – must be 1972 or previously. Jim Kaat has a 1-4 record. The scoreboard wouldn’t bother to tell us this unless he was pitching for the Twins. Check box score. Confirm lineups, line score, etc. Done. 2. 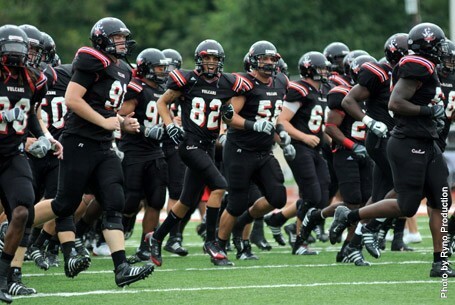 Are you starting to understand why I keep hating on NFL teams in dark monochrome, saying it looks like a D-II team? Thanks for the Dave Diles reference. [quote comment=”346134″]Thanks for the Dave Diles reference. Yikes. Lotta theories. Thank goodness we know “breathe through your eyelids” comes from BULL DURHAM. Like the Mets concepts quite a bit. Anything that loses the black is good and I cannot understand why the team insists on pushing it. The first 2 games of this weekend’s homestand, the Mets have worn black tops in both — that is simply wrong. I too am unsure about the orange alternate top, but love the blue one with the Mets script, and the blue cap with orange bill. 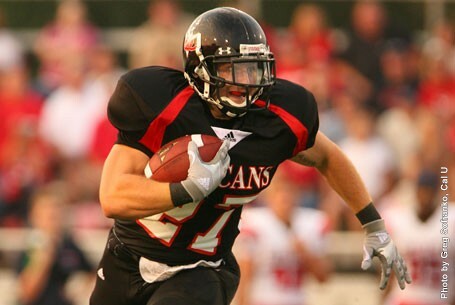 Chadron State is also home to two-time Harlon Hill Trophy winner, former NCAA all-time leading rusher and current Jets running back Danny Woodhead. Ok, I admit the mets need a little color in their lives, and Alex did a really good job. The blue concept is dece, and the orange is ok, but it reminds me of the Orioles too much. As for Jasons Rockies designs, I don’t mean to insult him, but Eeeeeyeugh! They look like gas station jerseys, and the numbers are awful. The hats are okay, I guess, but I am into the purple jersey concept. Finally, I almost pissed my pants, I was laughing so hard at today’s Benchies. Ricko, how would you like to have your comics on my blog? Emporia State in Kansas used to have this design for their helmet. Anyone know whats going on there? I think the older Emporia State helmet is much better, it was a unique look. Carson-Newman uses Colorado Avalanche numbers. Or something much like them. A lot of golfers on the PGA Tour wore their school colors and logos yesterday I am assuming for the start of the college football season. I commend Uniwatch for delving into the world of small college football, in some ways it’s superior to D1 football. * More players actually go to class and aren’t being arrested. * Less pressure on coaches means less corruption. When you stop and think about it, who cares about the level of competition? Certainly not the millions of fans who follow 1AA,D2,D3, and NAIA football. I would take issue with the headline of the story, you really can’t prove there are any more worse uniforms at the D2 level than D1. Also, it’s wrong to criticize the names of smaller college football. Sure, Pittsburg State is different, but what about D1 school names like Louisiana-Monroe and Florida International? I never understood that argument. [quote comment=”346144″]A lot of golfers on the PGA Tour wore their school colors and logos yesterday I am assuming for the start of the college football season. Mizzou has had that “funky diamond thing” for a while now. I was thinking the same thing about the Carson Newman/Avalanche numbers. I must have missed a post or two a while back, but I have no idea what “just one more bumper sticker syndrome” is supposed to mean. Those throwback uniforms Baltimore wore yesterday were awesome. [quote comment=”346145″]I commend Uniwatch for delving into the world of small college football, in some ways it’s superior to D1 football. No disrepect meant towards the names of the schools – just pointing out that they were different. I was laughing with them, not at them. I agree with everything else you said, though. D-II is a refreshing change of pace to the big schools these days. The Blue Rockies jersey would make a great soccer jersey (and coming from me, that’s not an insult – I like soccer). Obviously, Phil and I have slightly different tastes in unis, so I have no fear or trepidation whatsoever about the orange Mets jerseys. I love them. In fact, I was in a Champs Sporting Goods outlet recently and they had orange Mets jersey-looking t-shirts. I almost bought one. [quote comment=”346150″][quote comment=”346145″]I commend Uniwatch for delving into the world of small college football, in some ways it’s superior to D1 football. While I wasn’t criticizing Pittsburg, Kansas, after seeing yesterday’s game photos I should have criticized the new uniforms even more than I did. Now THAT is too much unnecessary piping! That new Pittsburg State design was originally (and still is) sported by Illinois. I too don’t have any real problem with an orange top for the Mets. Because of marketing and jersey sales and all that crap, alternate uniforms will unfortunately be here to stay. With that said, I’d take the orange tops over the black tops the Mets trot out there any day. I also think those orange spring training jerseys are much nicer and cleaner than the current black and blue spring training/batting practice (whatever) unis they wear now. Pitt State has more piping across the front and back – Illinois just had it across the back yesterday. I agree for the most part, but would tweek the blue tops by substituting orange script and numerals for the white. I’d never heard of “just one more bumper sticker” before I read it here but I knew instantly what it meant. You’re right! Knee-jerks never pay. [quote comment=”346161″][quote comment=”346151″][quote comment=”346148″]I’d never heard of “just one more bumper sticker” before I read it here but I knew instantly what it meant. Know what you mean – I used to love the Stamps’ unis, until they added the black and all the overkill designs. as a graduate of carson-newman i’ll say that i like our colors and helmets but the jerseys have always been a little over the top. also, it probably has a massive uni budget because it is an expensive private school. Hey Patriots, how about this helmet? The Phillies pre-game show has a good segment on right now about the “Saturday Night Special”–the maroon jerseys they wore for one night in the 70’s. Pretty interesting insight into the locker room reaction at the time. No doubt, bad uniform designs span all levels of college football. My point was, the headline of the article singled out small college uniforms. For balance, I wish the article included some great looking small college unis. I did too. Due to time constraints, we just looked at the preseason top ten teams. 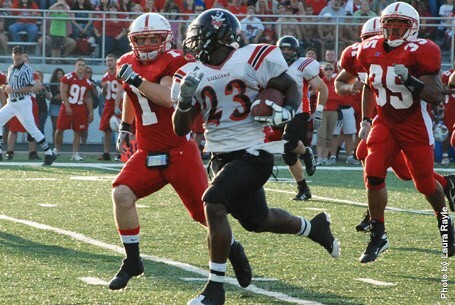 I will be scouring the web all season for good D-II and D-III unis. If I can find enough, maybe we can do a season review. Anyone who wants to nominate a school, let Phil know. I noticed that immediately too, and was coming here to post it! While watching, I couldn’t tell it if was two-tone, or just sweat-soaked. It looked like the areas below the shoulder pads were darker, and, I assumed, sweaty. But the pictures show crisp lines, so now I think it is just different material. STIRRUP ALERT! Yankees @ Toronto – Jays pitcher Brian Tallet’s rocking stirrups, but his pants aren’t pulled up all the way, they’re hanging halfway between his knees and ankles (capris?) but you can tell he’s got stirrups on. Tallet was briefly Uni-famous for rocking the stirrups, but he’s since ditched the look to my knowledge until today. Also, he’s shaved off his moustache, but grown giant 18th-century muttonchops at some point. Man, every time I see this guy he’s doing something freaky. [quote comment=”346172″]STIRRUP ALERT! Yankees @ Toronto – Jays pitcher Brian Tallet’s rocking stirrups, but his pants aren’t pulled up all the way, they’re hanging halfway between his knees and ankles (capris?) but you can tell he’s got stirrups on. Tallet was briefly Uni-famous for rocking the stirrups, but he’s since ditched the look to my knowledge until today. Someone pointed him out earlier this week. It’s a great look if you’re the kinda guy who doesn’t let his 13-year-old smoke at the dinner table…in front of her children. Nice idea today to look at smaller divisions in college football. College football is my favorite sport to follow. I was surprised to see the Vulcans picture when I opened UW today. My parents were from that area of SW Pa. Brownsville, Pa is nearby California. I am a Youngstown State grad and one day it would be nice to see 1AA. I still use the 1AA and division 2 and 3. I have not bothered trying to use or learn the “new” names for the lower divisions. I am also an hour and half away from division 3 powerhouse. Mt Union. Football fans should at some point go to one of those small college games. My brother and i went to see Mt Union crush Otterbein something like 60-0 a few years ago. From yesterday’s college games. Why or how did BYU have award decals on their helmets in the 1st game? Did they know they would beat Oklahoma maybe? Cal had metallic decals or at least the stripe was metallic. I think the Cal decal may have been also. It is obvious today’s uniforms are having more and more of the strange piping and patterns all over. I was flipping through the channels one day and saw Animal planet had a show about training killer whales. The trainers outfits looked like a killer whale. It reminded me of today’s football unis. Great post. I agree with you on about everything. 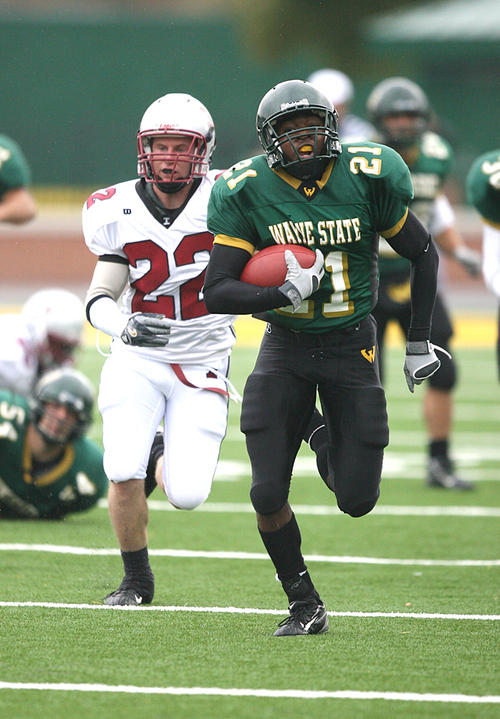 As a graduate of a Division II school (Saginaw Valley State University) thanks for the post. Too bad it had to start with our arch-rivals at Grand Valley. Nike CAN do full loops. So why the hell DON’T they? Make it stop. Pretty sure players know who they’re playing for and whom they’re playing against. Kinda think the fans and viewers know, too. “Quick, more bumper stickers!!! I see an empty space on a jersey!!! (overheard many times in design offices of today’s uni suppliers, I’m certain). And again, I don’t hate “new” and love “old”. I hate bad design. Just because someone MAKES a necktie with Harley Davidson logos plastered all over it doesn’t mean it’s a good looking tie (well, to those who rent powder blue tuxedos, maybe it does). For those of you that have AmericaOne or Comcast network, the Saskachawan RoughRiders on their retro unis have NNOB. Ole Miss RB Dexter McCluster? Now, see, his mom should have married a relative of the owners of a motel in northern Minnesota, Irv and Carol Fluck (honest, I still have their business card almost 30 years later), so he coulda gone “hyphenated” like Maurice Jones-Drew. Who makes Carson Newman’s uniforms? [quote comment=”346182″]I’m watching Ole Miss-Memphis. I hate the short, trucated “UCLA” stripes. Nonetheless, I do believe that their is, however weak and “douchebagish”, a rationalization AND a reason as to why the truncated stripe has taken hold in so many places that used to have real “UCLA” striping …. LSU has worn “UCLA” striping for about 50 years. About 10 years ago, the lineman with their sleeveless jerseys began wearing the truncated versions of the UCLA stripe, and the rest of the team wore the regular “full” version of UCLA stripes. About 7-8 years ago, during an LSU telecast/radiocast, the announcer explained that next year’s LSU jerseys would be changed the following year, and that all of the team members would wear the truncated version of the UCLA stripes, because “the NCAA” required that the team players’ jerseys “had to be the same”. Rather than make all of the players wear the “real” or “full” stripes, they would all wear the “short” or truncated stripes. That was the first and last information that I have ever heard regarding an explanation. I for one believe that it is not even true that “the NCAA” makes them all wear the same stripes. I think the LSU announcers ad it wrong, and I believe that the REAL REASON for the truncated stripes are the douchebag manufactuerers, starting with Nike, but really extending to all of them, that simply wanted to change for the sake of change, have high-profile programs in the NFL and NCAA wear the new “trucated” stripes, and to create a lucarative market for “newer” truncated style UCLA stripe jerseys, thus selling more uniforms and jerseys and replicas and etc., etc., etc. Everytime these douchebags put out a new style, no matter how awful, hundreds of high schools, smaller colleges and playgrounds have to immediately run out and re-outfit their teams in these styles, as the recent past so regrettably reveals. And by the way, the truncated stripes also look bad, pitifully worse than the full stripes. So there you have it, the promotion and proliferation of inferior, bad-looking styles of unis by manufacterers, over better looking established and traditional styles, all for the sake of increased sales and “change” for changes’ sake. The definition, in my opinion, of DOUCHEBAGGERY ! They do tend to go for the monochrome look, but they’ve got a bit of an Air Force vibe going. I dig. They’re in the same conference as Grand Valley (GLIAC) and finished 7-4 last year. Which doesn’t seem like much, but considering that GVSU has a total enrollment of about 25,000 and Hillsdale is a tiny liberal arts school with about 1,300, I’d say we do pretty well. Ferris St. (MI) – Minnesota? Bored with the OLE MISS/ MEMPHIS game, switched to Fox Sports Southwest and watched 1957 SWC Highlight show. IN COLOR !!! Fox Sports Southwest often runs these “SWC Legends” shows, that are a 30 minute SWC Yearly Wrap-up Highlights. Mid 1950s – mid 1970s. Lots of 1957 Rice, Texas A&M, Texas, TCU, SMU, Arkansas, Baylor action, etc. ALL IN COLOR !!!! Texas Tech wore Light Silver helmets and pants that season, with Red numerals and trim on White jerseys. Never saw that look before. NAVY in Old Gold pants and helmet, Sky Blue (almost white) jerseys with White UCLA stripes and numerals – no trim color at all. The Jerseys are similar to 1960s UCLA jerseys, but with block numerals and substantially lighter in color, if you could believe it, than those UCLA jerseys that were very light in their own right. The UCLA stripes were not truncated on the 1957 Navy jerseys. Earlier this week they showed the 1970 SWC highlights, where TCU wore the Very Light Purple jerseys with silver pants and helmets. Very unique look. [quote comment=”346191″]Bored with the OLE MISS/ MEMPHIS game, switched to Fox Sports Southwest and watched 1957 SWC Highlight show. IN COLOR !!! Fox Sports Southwest often runs these “SWC Legends” shows, that are a 30 minute SWC Yearly Wrap-up Highlights. Mid 1950s – mid 1970s. my Time Warner only gets a couple of those Fox Sports. I have seen a few of those.1948 was in color too. Not great color but still in color. I see 1966 is coming on again. i had seen that one. One more team wearing (succumbing to douchebag manufacterers’ forcing to wear) Vegas Gold. It is a nike thing. North Carolina has the same two-tone jersey It probably is for the heat down in Gainesville. And people say you don’t get stuff. Go figure. Northwood just made my top ten list! Love those colors. Something really needs to be done about the material those pants are made of. The two-tone jersey is bad enough, but to complete the outfit with see-thru pants is borderline criminal. Well, the concept isn’t that it’s based on the state flag, it’s based on the Colorado Rockies hockey team (more info found here: http://www.sportsecyclopedia.com/nhl/colnj/nhlrockies.html ), which just happens to be based on the flag. So, I wonder if there are any other current teams who have the same team name as a past franchise in a different (or same) sport. That would make for an interesting set of concept jerseys. [quote comment=”346174″]Nice idea today to look at smaller divisions in college football. College football is my favorite sport to follow. As long as I can call them 1-AA, I’d love to do a piece on them. I’m hoping to see a Duquesne game this year. If we do D-III, Mount Union has to be recognized. They are a powerhouse. I could do without their black and purple unis, though. The colors are indeed nice. At first glance, the unis look pretty solid. I’m not crazy about the solid blue pants, but I can live with them. Unfortunately, after further review, it looks like they’ve got a mild case of onemorebumperstickeritis as well. The Colorado Avalanche have the same name as the old MISL’s Denver Avalanche. Oh wait, according to the logo it’s the Denver Avalanche! Can’t leave out the exclamation point. Off the top of my head, the only same name/different sport I can think of is the Chicago Fire. The other ones that came to mind right away are all from the same sport. You’re killin’ me Johnny, you’re KILLIN’ me! am i missing something in the premise, or does “titans” count? There was a San Jose Earthquakes in the NASL and two different versions in MLS. Too obscure? My understanding is that it was same city/nickname. So, if the NFL’s Cardinals were still in St. Louis, it would count, but since the current Titans are in Tennessee whereas the originals were from New York, it does not count. 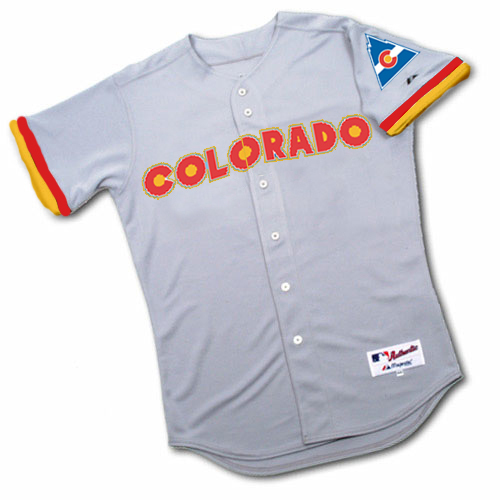 The Colorado Avalanche have the same name as the old MISL\’s Denver Avalanche. Correct, it would be the same city AND nickname. Like, a football uniform of the New York Giants based on the baseball team, the New York Giants.